Just one week after uttering his now-infamous “this is the calm before the storm” statement to the press ahead of a dinner with military leaders, we now learn that President Trump has dispatched a second nuclear aircraft carrier, the USS Theodore Roosevelt, filled with 7,500 marines, to the Korean Peninsula. Of course, this comes after rumors swirled earlier this week that North Korea is preparing to fire multiple short-range rockets around the opening of the Chinese Communist Party’s twice-a-decade congress on Oct. 18th. The USS Theodore Roosevelt, a Nimitz-class aircraft carrier, is en route to the western Pacific after leaving San Diego port last week. 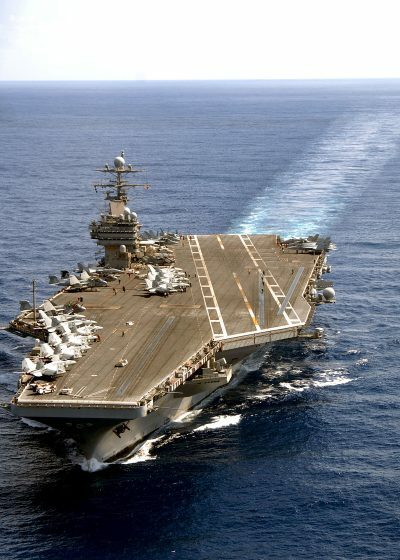 The Roosevelt will focus on maritime security operations in the Pacific and Middle East, the US military announced. But the £3.4billion ($4.5billion) warship, known as “the Big Stick”, has been sent to boost US defence on the Korean peninsula, according to South Korean media. It is expected to arrive in region in the coming weeks amid fears North Korea is about to test another missile or nuclear weapon. Per the following map from Stratfor, the USS Theodore Roosevelt will join the USS Ronald Reagan which is already operating in the region. According to a statement from Admiral Steve Koehler, a strike group commander on the ship, the Roosevelt is carrying some 7,500 sailors and marines that are “ready as a war fighting force”. “The US Navy carrier strike group is the most versatile, capable force at sea,” he said in a statement before the ship’s launch. So what say you? Just more bluster from a headline seeking President and normal-ish naval patrols in the Pacific or have we reached a point of no return in an escalating conflict with a rogue North Korean leader that could turn violent at any moment?